I know that Father's Day is still a couple of weeks off, but today is for my Dad. This was me 40 years ago. I wanted to be just like my Dad. I'd put on his work boots and hat then carry his work bag around the house pretending that I had a big day at work ahead of me. The hat is long gone. Today it's mostly baseball hats with golf logos. But, until today, he'd still put on his steel-toed work shoes, grab his work bag with his lunch and clothing, and head in to work LONG before I'd even think about getting out of bed! I grew up to be just like my Dad; when it comes to work. From him I learned work ethic, sense of loyalty, honesty, and the ideal that I should put my best effort into every job I do. From him I learned how to analyze a problem and come up with a solution; especially if it involved improving efficiency and productivity. (Okay, so I guess the same could be said about my knitting.) Neither of us doing anything "half way"! Enjoy your retirement, Dad! I'll go to work each day but I'm NOT getting up before the rooster! First: I won! I have been known to "haunt" a funky blog or two. This time, I came out of lurk mode for a contest and won. Annarella does some really neat things with her blog and makes some really cool jewelry for people and their knitting. Thanks Annarella for hosting this little contest and good luck to those that enter next time. It's been too hot to work today so we've been hanging out in our family room downstairs. 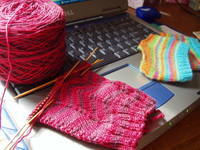 I've spent the last few nights writing up a pattern for this red skein of Socks that Rock. I was really pleased with what I'd come up with too...picot edge, 1x1 twisted rib and then a design of hearts (looking towards Valentine's Day) but that's when it happened; color pooling struck again! "Ruby Slippers" just will NOT work with 64 sts! Frustration set in after the third start on these socks and then I heard Cara's voice (well, actually, that would be her blog "voice" since I haven't actually heard her voice!) saying that Socks that Rock is absolutely the perfect yarn to knit Jaywalkers with and I cast on my 76 stitches and have been merrily knitting away today. I was going to surprise The Knitting Room with a pair of STR socks and a new pattern. Instead, I'll submit the socks and my critique/observations/review of the yarn. Oh, the rainbow, those are my daughter's flip flop footies reminding me that I have to write up a class description for them TONIGHT. Note: I just read that my Secret Pal received her box today. It is SO much fun to spoil someone who really appreciates it and shows it! I've made things for people close to me who didn't share near the amount of enthusiasm about it as she did! I also talked to Lorna who LOVES her birthday socks. She was so moved because the last person who knit her anything was her Mom: she died eleven years ago. That's why, this year, I decided to knit only for people who will appreciate the work & love that I put into each project. 3) If I had a choice, I would banish this yarn from my LYS: I wouldn't banish anything (not even acrylics) because everything has it's place in the "market", just not in my knitting basket, and I wouldn't want to deprive someone else of a yarn that makes them happy. 4) If I could only knit one more project for the rest of my life it would be: hmmm, socks is the first thing that comes to mind, as long as I have an unlimited supply of sock yarn for the rest of my life...the patterns for socks are limitless. But, if the question is what project might take me the rest of my life to finish...any of Ron Schweitzer's sweater might fit the bill. 11) Do you knit socks? Have you read my blog!?! 13) What was your favorite childhood movie? Sound of Music, Heidi, Patton, and The Great Escape. I'm sure that I enjoy Chicken Run because of it. I also thought Steve McQueen was the coolest thing around! Have you seen the TV series The Dead Zone? We think Anthony Michael Hall must be channeling Steve McQueen. 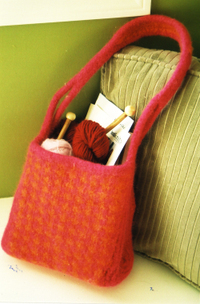 14) What is one thing in your knitting bag that you can't live without? Needles and yarn, oh wait, that's more than one thing. 15) What is lacking in your notions bag that you really, really want? a Skacel needle gauge and an egg darner (both can be found at Mielke's Farm). 21) What is the most challenging thing you have ever knit? My first original design (Jersey Girl). The knitting wasn't difficult but putting together all of the elements to come up with a design that could be duplicated by others in multiple sizes was a fun challenge. Around the World...in 2 hours! #1 & 24 are on opposite ends of the globe, but both turned me on to the Knitting World Cup. This is going to be much like the Knitting Olympics was. I've added my name to the list of knitters participating but need to determine which project to "enter". For those interested in charitable knitting...there is another Knitting World Cup just for the philanthropic. #30 has signed up for Trek Along with Me; a summer sock travel log. I will be adding the button link later today. And, yes, I stopped by Trek to make sure she'd heard about this one. What could be better than a KAL with your name in the title that was started by someone else!?! #27 & #31 had reviews for two books that I will be on the lookout for. 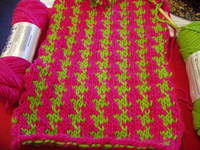 #31 was thoroughly impressed by Simply Fabulous Knitting. From what she wrote it sounds like a great resource for knitters. I'm hoping that I can find a copy to review for myself. When I teach classes, I like to provide resources that my students can use on their own to answer questions. I have been recommending The Knitting Answer Book. Doogie uses it whenever I'm not available to answer his questions. The other book that I discovered this morning is More Sweaters. From the images that I saw, and #27's review, this book is filled with information for shaping and charting your own designs. Of course, this book is out-of-print (aren't ALL the good design books!) but I may have to see about getting a used copy this fall when I am in sweater "design" mode again. This book would be AWESOME as an accompaniment to the other design books that I currently have (most of them are out-of-print). If it's meant to be mine, I'll be able to find one this fall. Right now I'm busy with my STR sock design. Unfortunately, this is a holiday weekend. For some of you that means rest and relaxation with lots of knitting time. 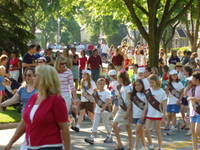 For me, this weekend is a working weekend prepping for a neighborhood garage sale that will happen next weekend. I have cleaned out all of the cupboards to get rid of previous passions "stuff". There are SIX huge Rubbermaid containers of fabric for the sale (plus cross stitch and quilting patterns). I have swatched several ideas for the STR "Ruby Slippers" colorway. I want to try one more idea tonight, but tomorrow I should be able to knit the sample. However, it's a good thing that I took the yarn photo yesterday...a huge storm came through at midnight and the petals from my tulips are gone now. At least I "captured" them while I had the chance. Back to work. When I went on my recent trip to Europe without him I left him specific instructions...if the unthinkable happened where we all perished and he was alone THEN he should sell everything, take the insurance money and move to Scotland to start a new life! He liked the idea (though not the circumstances) and my spirit would have been a peace while "haunting" him at Stirling. Breaking News: I've heard of legendary stashes but never heard of a stash bust and seizure! $13,000 worth of stolen yarn!!! Watch the video for photos of the booty and mugshots! Thanks Charlie Brown for sending the story. Progress is going nicely on Lindy Bag. I finished the main body of the bag and will work on the side panels and straps over the next couple of days. It's been quick and easy and not at all boring. However, it's not going to be the bag that I thought it would be when I purchased my yarn in January. You know how it is, you see something in a catalog a pattern and (based on how it's photographed) get it because it'll be perfect for fill in the blank. See this. Optical illusion, I tell you! Last night, as I was nearing completion of the houndstooth bag portion, the instructions were "work in chart pattern until piece is 30"." Wait, then fold that piece in half (15"). Hmmm, what did the pattern's finished dimensions say? "8" x 8" x 4" after felting". NOOOOOOOO! From the pattern photo, I figured the bag to be approx. 12" x 12" x 4", just like my knitting bag. This is going to be SO much smaller than I'd expected. This bag will not end up being the kind of thing to throw things in for heading down to the lake with the kids. Now, I look at the photo and wonder things like: what size needles are in that bag? How small are those skeins? And, are those patterns (which are 8.5 x 5.5") actually IN the bag or merely perched along the couch pillow? I DO like the bag (an IndiKnits design) and am anxious to try out these handles (the real reason that I bought the pattern). I'm persnickety about pattern sizes for clothing. I've read the articles that caution about how clothing is photographed. Guess that applies to accessories as well. Well, now I know to proceed with caution (and a tape measure). Note: I purchased the recommended yarn amount and there won't be enough to simply adjust by knitting more length. Oh well. Getting REAL mail is always SO exciting! This is my new sock bag from Trek. She makes these great sock project bags for barter. I sent her a load of my quilting fabric (don't talk to me about yarn stash, you should see my languishing fabric stash!) and a treat. She made up bags for me (one of which is for my SP so I can't show you it today). Cool! Trek will have a number of new bags that you can trade her with yarn, goodies, whatever for a bag that is perfect for little projects. Go check it out. 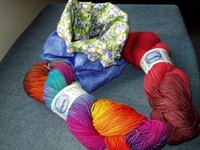 One of these two skeins of Socks That Rock are waiting to "jump" into my new sock bag. I can't decide if I should do the multi-colored "Fire on the Mountain" or the semi-solid "Ruby Slippers". I plan on writing a sock pattern this weekend for one of these skeins. I guess the pattern will determine whether I should use the multi to show off the yarn or the solid to show off the pattern. Let me know what you think. Stay tuned. I've been told to watch for Postal Pat with another package; this one from my SP. I can hardly wait! Yesterday, I posted a parel to my own SP. When's the last time YOU looked forward to opening the mailbox!?! How about a little cake with that birthday!?! Purchase a cake mix complete with frosting. Remove all ingredients from package and preheat "oven". Prepare cupcake and frosting according to package instructions. 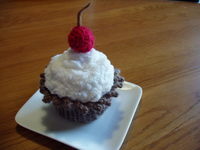 "Frost" cupcake and top with cherry and bead sprinkles, if desired. As you know, I love knitting socks! I love that I can picks up needles and yarn on Wednesday and have a pair of socks by Sunday. Well, that does, of course, assume that I have a pattern that I want to use (no problem finding one), the needles that I need (several sets of DPNS in sizes 0-3 in house), the yarn that I want to use on hand (hopefully no more Ebay trips for awhile! ), and a "clear" schedule (not counting work, family, Mom "taxi" duties, cooking, cleaning... you get the idea). Having a time deadline "incentive" helps as well. In this case, the deadline is a birthday. A birthday that is this coming week. (Nothing like working ahead!) These are ready to be wrapped and packed and shipped off tomorrow. Whew! They will be at her doorstep FOR her birthday. I'll put the stats out on the socks in the finished items. 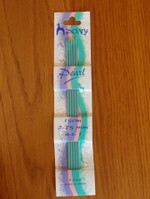 But first, I want to tell you about these Pony Pearl needles. I usually use bamboo DPNs, but the ladies at the Knitting Room suggested trying these. They are plastic with, I believe, a metal core. On the plus side, they were smooth and great at "sliding" through the yarn. Also, when working with really small needles, I often feel like I'll snap the bamboo DPNs in two when I K2tog; not a problem with these. On the down side, these have rounded tips. I am a loose knitter but I think that if a tight knitter used these they may have a problem getting the round tip INTO the stitch. Now you know. I've finished two pair of socks this month. Now it's time to dive into the stash and pull out a project. I bought this in January and think it'll make a great bag for this summer. Now that I know that our wash machine will work for felting, I have the confidence to get this started. Don't worry though, I'll have socks back on the needles at some point this week. My sock needles are never "naked" for long.